Look! Up in the sky! No, really, we’ll wait. What’s up there? Well, in the big, cosmic scheme of things, pretty much everything. That’s a heavy concept to wrap your brain around, especially when you live in a state where anything more than 20 minutes away is considered a “hike.” Once you start measuring things in light years it really gets squirrely, but here’s the trick. The incredible, infinite wonder of the universe isn’t really as far, far away as you’d think. 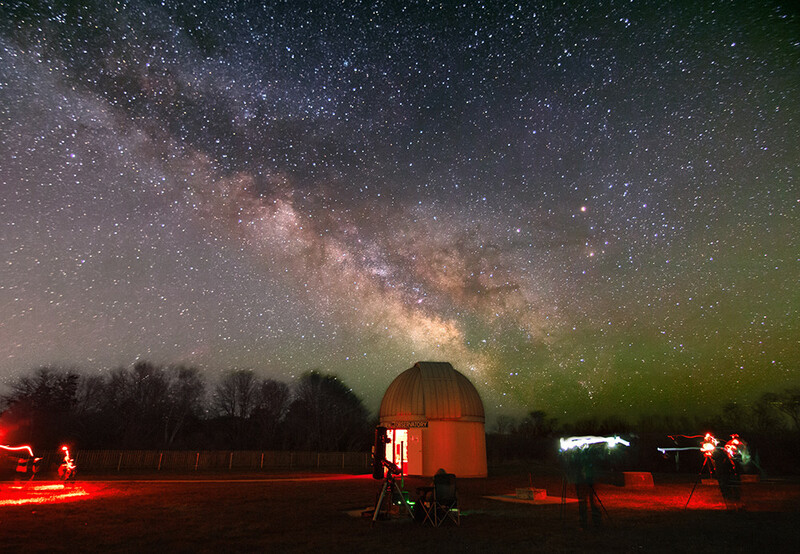 If you don’t believe us, just ask the stargazers at the Frosty Drew Observatory in Charlestown’s Ninigret Park. For them, a trip to Saturn is easier than a trip to Warwick. All they need is a clear, dark night and that big, beautiful telescope of theirs. “Every telescope has a strength and this one is fabulous for Saturn,” says observatory director Scott MacNeill. The telescope – a Meade LX200 Schmidt Cassegrain – is great for seeing the equatorial bands on Saturn, which are weather fronts within the planet’s atmosphere, the planet’s moons, and yes, those striking the rings are very clearly visible. Frosty Drew sits in a wide-open park, surrounded by protected federal lands with nothing beyond but the big, wide Atlantic Ocean. What this means for stargazers is the right kind of darkness, a field of stars relatively unmarred by man-made light. You can even get a look at the Andromeda Galaxy – which will be in prime viewing over Rhode Island in October – with your naked eye. Andromeda, in fact, is the only object outside our own galaxy you can see without the aid of a telescope. Speaking of galaxies, the Milky Way is a photogenic star full of them. Photojournalist Mike Cohea has been capturing the thick band of stars and nebulae – the galactic core – with his camera for over a decade, but in the last year and a half or so has attracted the attention of wide-eyed Rhode Islanders on Instagram – follow him @mikecohea if you aren’t already and prepare to have your mind blown – with his dazzling shots of our home galaxy captured over Trustom Pond Wildlife Refuge and Block Island. One scene in particular needs to be seen to be believed – a lovely long exposure of the Milky Way photobombed by a swarm of fireflies, their electric green lights trailing across and dotting the frame. “I’ve never seen so many fireflies. It’s one of those moments where I have to remember that I’m a professional photographer and not [lose it],” he says with a laugh. Capturing these images requires late nights and a lot of patience, meaning a solid afternoon nap and a willingness to stand out in a field for hours in the dead of night, but the results speak for themselves. Cohea also frequently turns his photographer’s eye to our nearest cosmic neighbor, the Moon. 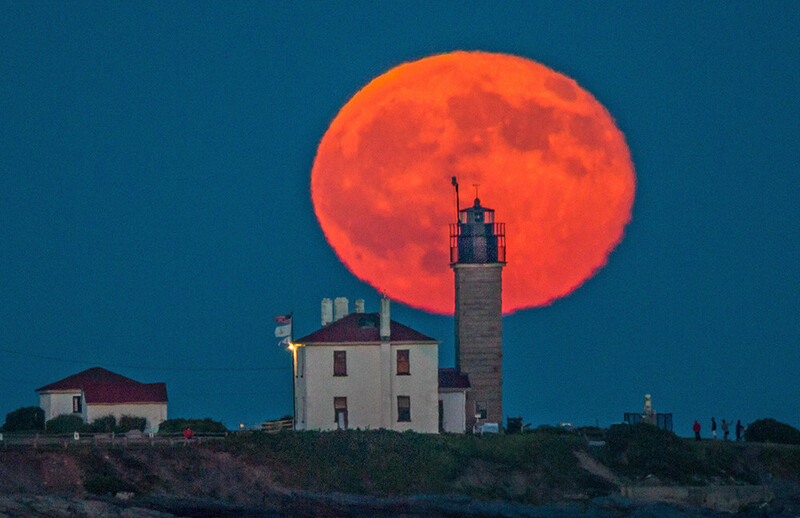 In particular, he specializes in time lapses of full moonrises and stunning stills of the moon over southern Rhode Island’s lighthouses and bridges. Using long telephoto lenses creates the optical illusion of the moon appearing larger than it does to the human eye. These shots require precise timing and positioning, often miles away from the earthbound foreground subjects. For Cohea, sharing something as big and distant and weird as the Moon or a faraway part of our galaxy in the same image of something as familiar as Beavertail or the Newport Bridge boils down to one thing – communicating to others that it’s all there, if we know where and how to look for it, and it’s ours to discover. That same spirit drives the men and women who work at Frosty Drew. “We get some little Isaac Newtons,” says MacNeill. “[Kids that] come out and they’re thinking about orbital dynamics, planetary and stellar formation, and they ask questions. We try to tell every kid that’s between five and twenty years old that they’re part of an important generation. The first person to set foot on another planet is walking on Earth right now. They’re a kid, they probably don’t know it’s them, and that opportunity is available to anybody.